The 4802 is designed for daily and serial weighing of neonates, infants and toddlers. Itâ€™s a heavy-duty, stainless steel, portable unit with a built-in digital readout. This scale is accurate enough to weigh neonates and has a large enough capacity for peds. The 4802 automatically returns to zero, allowing you to weigh a continuous stream of patients quickly and efficiently. A â€œRecallâ€� feature retains the last weight reading. If the patient is removed from the scale and you forget the weight, simply press the â€œRecallâ€� button. The previous weight is displayed, and a â€œPrior Weightâ€� message blinks. Since accurate weighing of active babies is difficult, many scales take an average between a high and low reading or lock-in a reading after an arbitrary length of time. Scale-Tronix systems display the actual weight so you will never medicate or treat an infant based on an inaccurate reading. In addition, the press of a button allows reweighing while the baby is still on the scale. An audible signal indicates when the patientâ€™s weight is stored in memory. A printer is available (special order) to provide a paper-tape record of patient weights. The 4802â€™s readings are so accurate and repeatable that breast-feeding intake may be determined by weight. The 1 gram weighing option enables you to weigh diapers automatically to 1 gram, ideal for determining urine output. The 4802 is line-cord powered for stationary use or powered by its self-contained battery for portable use. Weight is displayed with the touch of a button in either pounds or kilos. Oversized, 4-sided and flat weighing cradles are also available. 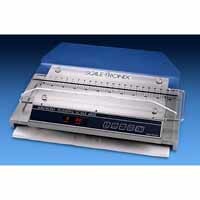 The unique Scale-Tronix stainless steel weighing cart makes the 4802 a self-contained, mobile weighing station. The cart also features an optional dispenser for disposable scale liners. Accuracy - 2/10oz-5 gm. Diaper/Preemie weighing 1 gm (optional). Weighing Range - 45 lb-20 kg. Overall 27 1/2" X 16" X 7" stainless steel weighing platform. Removable acrylic cradle - 25" X 14". Length measure in centimeters and inches. Readout - Digital LED display in pounds and kilograms. Power Source - 110 VAC line cord and self-contained battery with charger (operates in either mode). Cordless operation available as special order. Automatic Zero - Returns to zero, ready for next patient. Reweigh - Recomputes weight while patient is on scale. Weight Recall - Recalls last weight. Low Battery Indicator - Indicates battery needs replacing. Charge Indicator - Indicates battery is charging. Weighing Cart (accessory) - Stainless steel, mounted on 4 large rubber casters. Computer Capability - RS-232 output (optional).